I think this is one of the best picnic and BBQ party salads of all time. It is one of those dishes that once you start eating it, you can’t stop, because there is something about that sweet vinegary garlicy flavor that is just addicting. It has soft beans, crunchy beans, celery and onions, plus a mess of herby basil and parsley. And it can travel and sit out without you worrying. We ate this salad all gone in about 10 minutes. Now I have to make another batch and maybe I’ll double it this time. You know how I love leftovers. 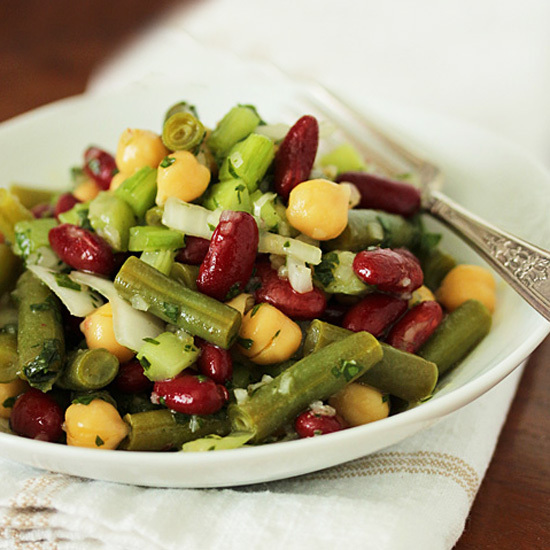 Your salad can be customized with other beans, such as lima beans, black eyed peas, edamame, or black beans. You could also add cubed avocado, red pepper or corn kernels. Make it your own. 1 In a medium bowl, whisk together all vinaigrette ingredients. 1. Cook green bean pieces in boiling water for 2-3 minutes until crisp tender. Immediately drain and place in cold water bath. When cool, drain. 2. Mix salad ingredients in large bowl. With paper towel, blot water from veggies. 3. Pour vinaigrette over and mix to coat. Cover and chill for 2-4 hours, stirring occasionally. 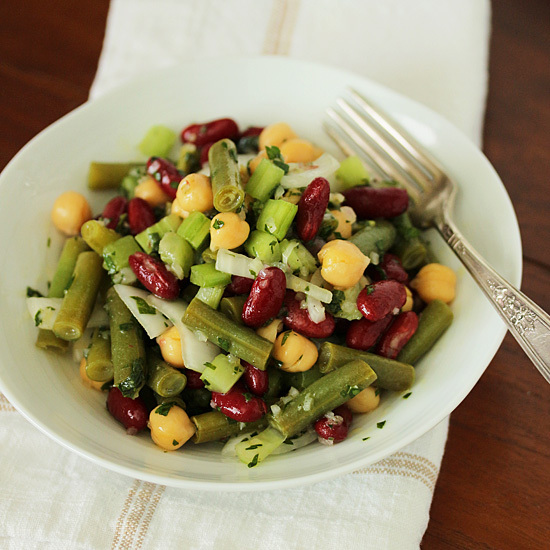 Note: Salad can be held overnight; however, fresh green color of beans may fade. This would be perfect for an outdoor barbeque. No mayo in the dressing! Thanks for sharing!